Nos últimos tempos tenho partilhado aqui neste blog alguns recursos que encontro e que gosto e uso, como tutoriais, revistas digitais, free downloadable prints, porque este é também um espaço de partilha. Sei que muitos de vocês gostam destes recursos. Eu também gosto de ler todos os comentários: um GRANDE Obrigada a todos os que param um segundo para dizer 'Olá'. São sempre bem-vindos! 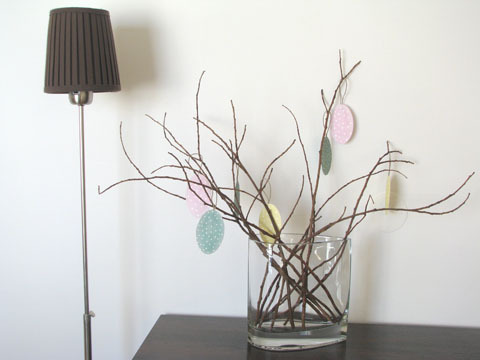 Com a Páscoa a aproximar-se, e a Primavera bem instalada, fazem-se as limpezas de Primavera, dá-se um arranjo à casa para um toque mais festivo...e a pensar nisto, no fim de semana passado, fiz uma decoração de Páscoa com materiais acessíveis: ovos de Páscoa em papel (padrão desenhado por mim em tons pastel) que podem imprimir, recortar, colar e pendurar onde ficar bem! Podem fazer o download do ficheiro no link e seguir as instruções abaixo. 1. Descarregar gratuitamente o ficheiro Easter Eggs. 2. Imprimir em papel A4 branco. Usei papel Fabriano (200g/m2). 3. Cortar cada forma oval pelo tracejado. Cada ovo será composto por duas formas ovais da mesma cor. 4. Cortar cerca de 18 cm de fio (usei este), um para cada ovo. 5. Dobrar o fio ao meio e colar as duas partes do ovo com o fio no meio. Este ficheiro é apenas para uso pessoal e não para fins comerciais. Quer isto dizer que poderão fazer as cópias que quiser para uso pessoal e não para venda. Se quiser partilhar este ficheiro com amigos, poderão enviar-lhe o link deste post. Ficarei grata! Obrigada pela compreensão. Os nossos Ovos de papel já estão na sala pendurados nuns ramos secos. Uma sugestão para fazer com as crianças nestas férias. Divirtam-se! Ah! e já agora mostrem as vossas decorações com estes ovos em papel ou outras, nos comentários abaixo...é sempre inspirador! Recently I been sharing some resources here on this blog, such as tutorials, digital magazines, free downloadable prints that I find and use for myself, because this blog is also a space for sharing. I know that many of you enjoy these posts. I also enjoy reading all your comments: A BIG 'Thank you' to all of you (you know who you are) who stop a second to say 'Hello'. Ireally appreciate that! With Easter approaching, and spring installed properly, there's time for Spring cleaning, there is time for some home holidays decorations... and thinking on this, last weekend I created a holiday craft for Easter Easter with accessible materials: Easter eggs in paper (I designed the pattern in pastel shades) that you can print, cut, paste, and hang them where you want in your home. For free! You can download the file from the link and follow the instructions below. 1. Download your free Easter eggs. 2. Print onto 8" 1/4 x 11"3/4 heavy-weight white paper. I used fabriano paper (200 g/m2); 94 lbs). 3. Cut each shape by the dashed line with scissors. Each egg will have two of these oval shapes with the same colour. 4. Cut about 6 inches of twine (I used one like this) one for each egg. 5. Fold the twine and use glue to unite the two shapes and the twine in the middle. This downloadable file is for personal use only. This means you are welcome to print as many copies as you wish for yourself (not for commercial use). If you wish to share this download with your friends, you can direct them to this post for the download. I would appreciate that! Thank you for your understanding! 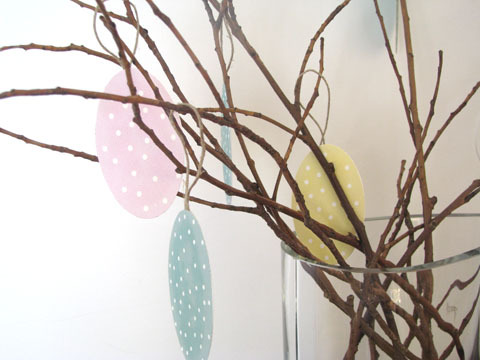 Our Easter paper eggs are already in the living room (hung in some branches). This could be an activity to do with your children this holidays. Enjoy! Oh!... come here and show your decorations with these eggs in paper or other holiday decorations you are doing in the comments below... it is always inspiring! So so pretty! They look so stylish too!